Waikiki Beach in Honolulu feels like the epicenter of the Hawaiian hotel universe. There are so many hotels and resorts stretching along the length of Waikiki Beach, the choice of where to stay in Honolulu can be a dizzying one. If you’re looking for a central, reasonably priced resort on Oahu with lots of amenities and something for travelers of all types, the Sheraton Waikiki in the heart of Waikiki Beach might be right for you. The Sheraton Waikiki Hotel epitomizes a large, well-run, corporate resort hotel. It houses over 1,600 modest updated rooms on 30 floors, built in a triangular formation to allow for maximum ocean views. The resort is immensely busy, with people from around the world coming and going at all hours of the day and night. It’s located on a seriously prime piece of Waikiki oceanfront, between the historic Pink Palace (the Royal Hawaiian) and the Outrigger Reef on the Beach. 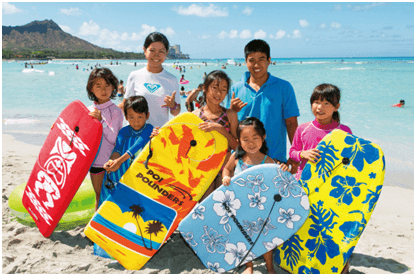 The Sheraton Waikiki Hotel is just steps away from the highly upscale Royal Hawaiian Shopping Center, and the main shopping street of Kalakaua Avenue. The Sheraton’s location in the heart of the Waikiki beachfront hotel strip represents one of its major assets. You are close to shopping, dining, the beach, water sports, and many downtown Honolulu attractions. You won’t need a car, though if you do have one, parking is included in your $31 daily resort fee, (along with other amenities such as WiFi, poolside towel service, free long distance phone calls, a complimentary portrait photograph, and some welcome drinks at RumFire restaurant). 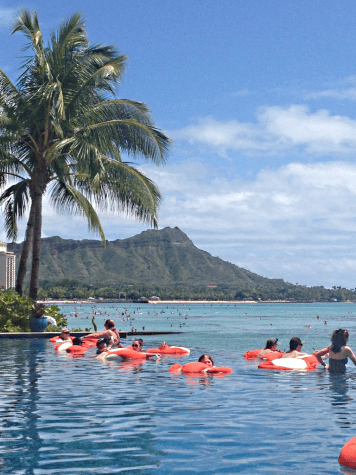 Waterslide at Sheraton Waikiki – whee! The Sheraton Waikiki has undergone some major renovations and upgrades over the past few years, including changes to its two pools–the Helumoa Playground and the Infinity Edge Pool. The hotel prides itself on its family-friendliness, and the Helumoa Playground aquatic area doesn’t disappoint the under 12 set. There are two fresh-water swimming pools, a 70-foot-long waterslide that descends from a modest height of 15 feet, two whirlpool hot tubs, a tot-friendly water play area, and reserve-able poolside chaise loungers–all with a view of Diamond Head and Waikiki Beach. Snacks and meals can be delivered poolside, and pool staff offer water activities throughout the day. Floating in the new, spectacular Infinity Edge Pool feels like you’re right at the oceanfront’s edge. This pool is for those 16 years and up (though my two younger teens managed to sneak in twice). It provides a wonderful spot for early morning laps and Aquafit classes, or just lounging and watching passers-by on the walkway right below the pool’s ledge. Or, you can laze about in a bright orange floating bean bag chair, from which you could easily sit with Mai Tai in hand, watching the world go by for hours. The key to nabbing a free lounge chair at either pool involves getting up early to ‘reserve’ your chair with towels or personal items. Although the pools officially open at 8 a.m., many chairs are already claimed by this early hour. There simply are not enough loungers to accommodate all of the hotel’s guests, unless you want to pay $50 for the privilege of having somewhere to sit. We learned this lesson on our first morning’s fruitless search for chairs. We had no choice but to leave both resort pool areas, opting for some towel time on the sand of Waikiki Beach (not so bad, really). The Sheraton Waikiki offers a wide variety of restaurants and cafes on-premises. Options include two locations of Peet’s Coffee (a breakfast lifesaver! ), Ingredients casual dining restaurant, the Edge of Waikiki pool bar and grill, a Baskin & Robbins ice cream parlor, and the new-ish upscale tapas and libation restaurant, RumFire. Honolulu is one of the most expensive cities in the United States. My family of four noticed this right away when dining out, even when we purchased a simple breakfast of lattes, juices and oatmeal. Be prepared for some sticker shock both at the hotel and around town. Take note that the Royal Hawaiian Shopping Centre (just steps from the Sheraton) has a food court on the second floor, with fast and more reasonably priced food. The Sheraton Waikiki hosts a high-end spa facility, Spa Khakara, that boasts an organic, natural spa experience with a variety of massages, facials and body treatments. The resort also has a fully licensed children’s daycare center that is run by a third-party, independent from the Sheraton. Poppins Keiki Hawaii hosts full daycare and babysitting services from $20-$30 per hour, depending upon the child’s age. Crafts and excursions are also available at this kids club. All staff are bilingual in both English and Japanese. While the bustling pace of the Sheraton Waikiki took some time getting used to, the beauty and convenience of being in the center of the action in Waikiki was truly luxurious. Have you visited Waikiki? Do you like the bustling pace of this area of Hawaii? Let us know in the comments below! 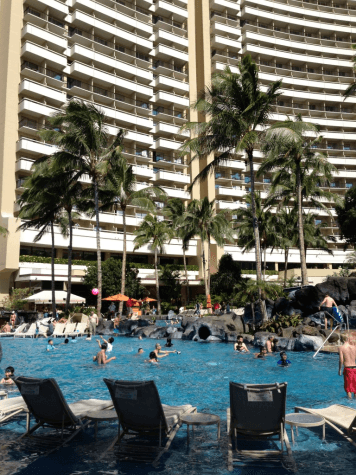 A Note from The Curious Travel Mama: A small portion of our experience at the Sheraton Waikiki Hotel was discounted by the hotel. This did not influence my review in any way, nor was there any expectation by the resort. We have only been to Hawaii once and spent a week on Maui and a week in Honolulu staying on Waikiki. I preferred the quieter experience on Maui but we had a great time in Honolulu as well. Love the idea of floating around on a bean bag chair in that infinity pool! I know exactly what you mean, Lisa. The hustle of Honolulu after spending ten laid-back days on Kauai was almost overwhelming. I think our family will try it in reverse next time. A bit of the urban Waikiki experience first, then serious down-time on one of the other Hawaiian islands. Mahalo! I couldn’t have asked for more and if we ever return to Hawaii we will definitely stay at the Sheraton again. Perfect location!! 100%! Thanks for your comment, Duffy. Glad you enjoyed yourselves!